My loves, to your left feast your eyes on Bop Basics’ fabulous Faux Fur Trapper Hat; on the right take a peek at Forever 21’s Faux Fur Hat. While the Forever 21 marvel is a slightly lighter brown hue than the Bop Basics beauty, and sports dangling tassel pom-poms; for a mere $10.80, in comparison to the $98.00 needed to take the blissful Bop Basics piece home, it is just as capable of adding a smattering of stylish coziness to one’s look du jour, at a price that is oh-so right for the budget babe! No question about it, I'd do the Forever 21 one! It's such a cute hat! I'll look for it when I'm at the mall!! I'll take the Forever 21 one as well! What a fun hat! I'd def do the F21 one :) Great find~! I don't think I'd pay the Bob Basics price for a hat, but I actually prefer the coloring in it to the coloring of the Forever 21 version. These look so cozy! They'll definitely be perfect for keeping warm in the cold weather. 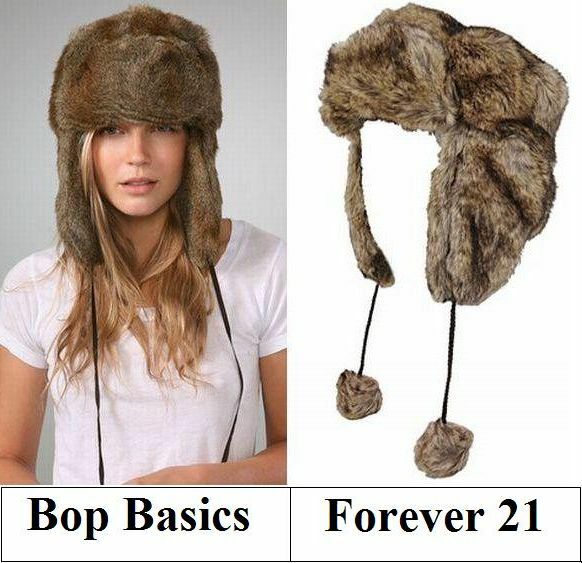 I'm gonna go with the Forever 21 hat though. So much more affordable! Great find!! Have a great day! Utterly adorable on the model but I could not pull this look off. None for me. i wish i could get away with wearing a cute little hat like that! it's sooooo fun!! They pretty much look identical from where I'm sitting, though the Bop Basic might be a tad warmer. Not sure I could pull off this look, but I'd go for the F21 version! The Forever XXI hat is such a great deal. I would definitely go for that one. Hope you're having a great day. What a cozy looking hat, love it! Both look so cute & comfy - and I wish I had one today; it was so cold in NY! I love f21 hats! And now you are making me want to go to Sweden or someplace cold and show off my awesome hat! I guess it depends what you are gonna use it for. My Dad, a mail man who has to traipse through some harsh winters has something similar to this from L.L. Bean. And if he keeps it out for long, the cat likes to curl up in it. But I'd go for the cheaper. Maybe buy more than one because get some giddy friends going, and they just might steal it. Yes, welcome to my world...of winter. Of course, we never really know when winter might set in. Last year, a bit before Christmas. Forever 21 is always fun. Love their stuff. Love the trapper hats. Think I'll go with the one from Forever 21. Oooh me like. I must have one of these! Trapper hats are the bomb!! Such a great steal from F21!! Love it! Yes please to the F21! I try to never spend money on hats because I always lose them somewhere. totally choosing F21 and I love it!! I love the trapper hats! The $98 price tag for the Bop Basics doesn't sound too bad, either! London is freezing these days. I could do with one of these: they both look so warm and cosy. I definitely prefer the F21 one. Love them both, but sorry to say that California is not usually cold enough to don one of these. But, they do look great! Love your site...thanks! Love this! I have one from Wilsons Leather, I think I paid around $30 but its totally worth it to me! F21 it is for me because i like thefact that the colour is lighter and ofcourse it is cheaper. OMG--I've totally been wanting one of those! I'll try to snag that XXI Forever one. So cute! I'm not a big hat person but this one is darling. OMG I always laugh when I see people wearing these in warmer climates, but I do think they are great when you actually live somewhere really cold... like me growing up! i think these hats are cute! Definitely a sweet deal at Forever 21.
for something like this, i would go the cheaper route! Must go with Forever 21. Gotta love F21!!! Fun hat! Not realy my style, but great find nonetheless! i don't really need to wear either of them because it won't ever get that cold where i live. but they look super similar. I need one of these for the winter! I wanted to one of these sooo bad last season, but couldn't find one cheap enough! I will totally be hitting up F21 soon as my first paycheck comes in! I NEED a faux fur trapper hat now that I'm moving to somwehwere where it snows! I would have so much fun accessorizing with one. Love that hat im determined to get one this winter!